Engineered for Art: Powerful. Immersive. Enthralling. Emotive. Amplifier Topology Ovation High Fidelity amplifiers exclusively use fully symmetrical, balanced Current Mode Topology* (CMT) designs which feature a unity gain buffer input stage that drives a single, high gain voltage amplifier stage which in turn feeds into a unity gain emitter follower triple output circuit (described in more detail below). The figure above shows a simplified CMT amplifier on the left, and a VMT on the right. 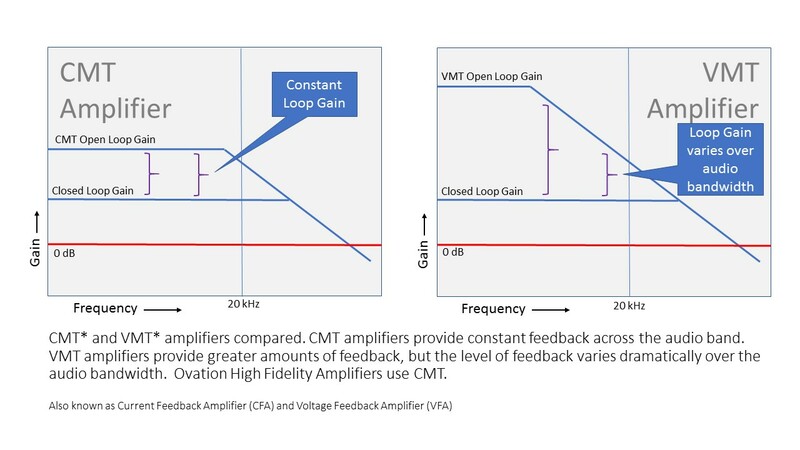 In CMT amplifiers, only a single voltage gain stage is required within the amplifier, unlike competing topologies where at least 2, 3 or sometimes more are used. The front end buffer and output stages are unity gain and optimized for low distortion. If the single, main gain stage is then also optimized for very low distortion, we have the best of all trade-offs. Output Stages Our output stage designs all use the ‘ Locanthi T’ triple, also known as an EF3. This provides unity voltage gain but a current gain in excess of 4 orders of magnitude. This is key to ensure there are no loading effects on the single main gain stage (as described above) which would result in greater 2nd and 3rd harmonic distortion. Output stage transistors are matched for gain and Vbe to within 10% ensuring accurate thermal tracking, thermal stability and enhanced distortion performance. The high gain-bandwidth (fT) devices used offer exceptional Safe Operating Area (SOA) capability and very high hFE vs Ic gain linearity, contributing in large part to the very low distortion of the Ovation High Fidelity power amplifiers. The result of using these high performance devices and the EF3 output stage circuit is a highly load tolerant amplifier, showing very little or no increase in distortion with speaker impedances down to as low as 3 Ohms, reference the 8 or 16 Ohm distortion figure. 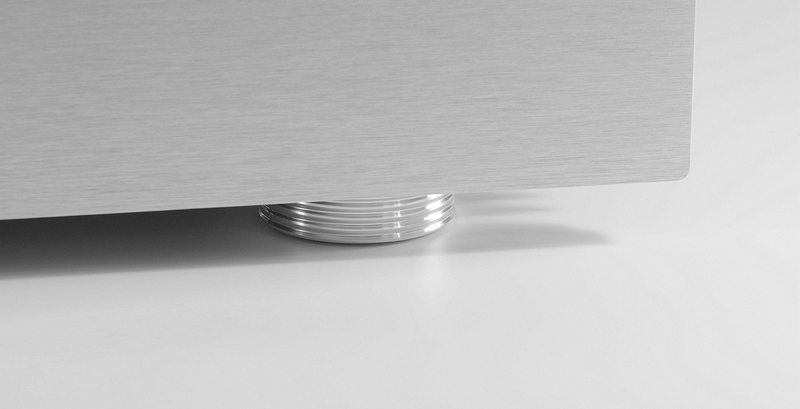 A design feature of all our amplifiers is the exceptional current delivery capability. The Model 1701, rated at 100 Watts RMS per channel, will cleanly deliver > 20A into the loudspeaker load while the corresponding figure for the 240 Watt Model 1721 is > 60 Amps. This power capability in our view makes for a fatigue free sonic presentation, allowing the amplifier to seamlessly interface the dynamic requirements of the music with the dynamic load impedance of the loudspeaker. 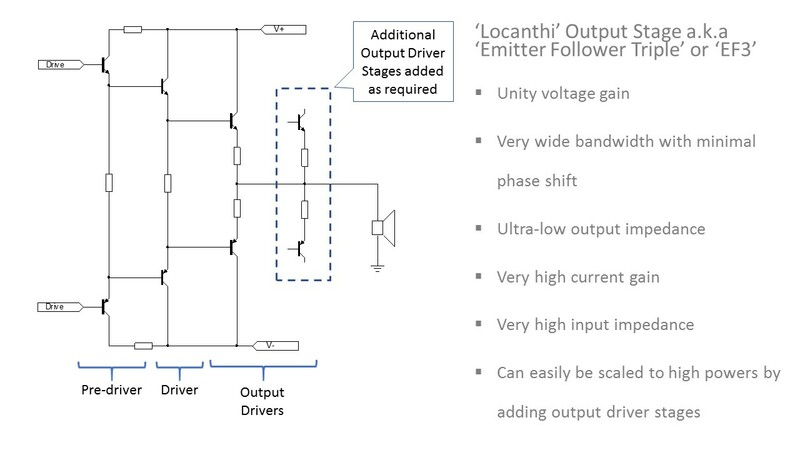 To achieve these very high output current levels, all our amplifier output stages are very generously sized which then also enables them to handle loads with large phase angles. Importantly, this high power output current capability is also wide-band as evidenced by the fast rise/fall times of the output voltage and current in the above figure. In our amplifiers, the output stage and speaker currents are sensed directly and if exceeding a pre-set threshold (60 A for the Model 1721 and 20 Amps for the Model 1701), the speaker is instantly disconnected using a solid state relay. The relay operate time is < 100 microseconds from the application of the overcurrent condition to disconnecting the loudspeaker. This technique allows us to exploit more fully the SOA region of the output power transistors without invasive protection schemes and goes a long way to explaining the very open sound of our products. 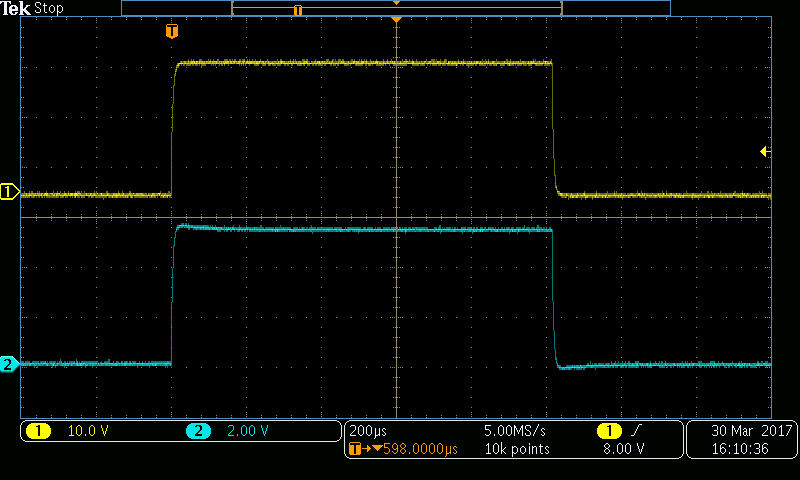 In the figure above, the current pulse is delivered into the load, but is terminated ~ 80 microseconds later. As the load (~0.5 Ohm +0.1 Ohm sense resistor with a total inductance of 2.3 uH) is disconnected by the solid state relay, inductive fly-back causes the output voltage to spike negative and is quite normal behaviour. Power supply performance is critical in any high performance amplifier. At Ovation High Fidelity, transformer VA ratings are sized at 5x the nominal single channel output power into 8 Ohms. The Model 1701 features a 500 W power supply enabling it to comfortably deliver 180 W per channel into 4 Ohms, whilst the single channel peak output power approaches 450W (50 milli-second transient). Large reservoir capacitors with working voltage ratings well in excess of the highest possible supply voltage ensure many years of reliable, trouble free service. All our toroidal transformers are custom wound in England and feature an inter-winding screen to minimize mains noise ingress while a flux band minimizes the already very low radiated magnetic field. Importantly, we use oversized cores and run the transformer flux density at about 10~15% below normal commercial levels. This reduces audible noise arising do to magneto-restriction and makes the transformer much more tolerant of mains DC which arises when the 50/60 Hz supply is not symmetrical about neutral – often the result of household equipment that uses half-wave rectified mains – like a hairdryer for example. Amplifier and Loudspeaker Protection A comprehensive microprocessor based protection system continuously monitors the output for DC offsets, output overcurrent (as already described earlier), and over-temperature conditions and quickly disconnects the loudspeakers if required. 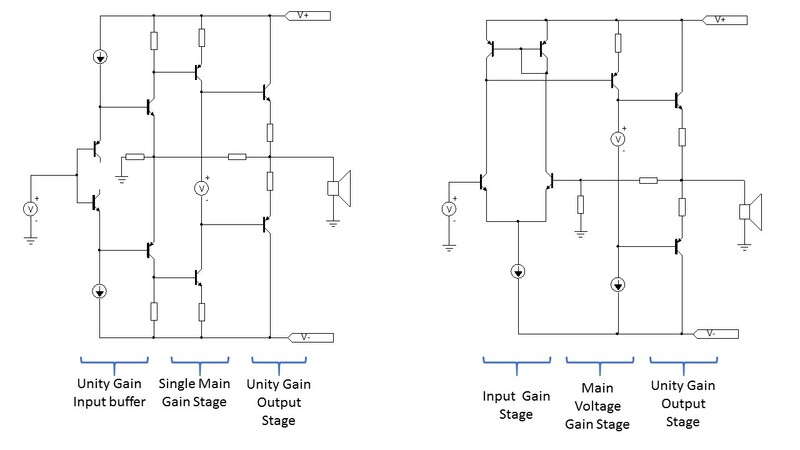 Additionally, when power is applied to the unit, the mains current is limited for a short period to prevent component overstress’s during the power up cycle while the transformer core magnetizes and the reservoir capacitors charge-up. This approach also ensures that there are no unwanted mains interference transients at switch-on. During power-up and power-down cycles, the loudspeaker outputs are muted to prevent unpleasant audible noises and thumps. The solid state relay (SSR) used to couple the amplifier output to the loudspeaker terminals features switching times that are at least 50 times faster than the conventional electro-mechanical relays used by our competitors. 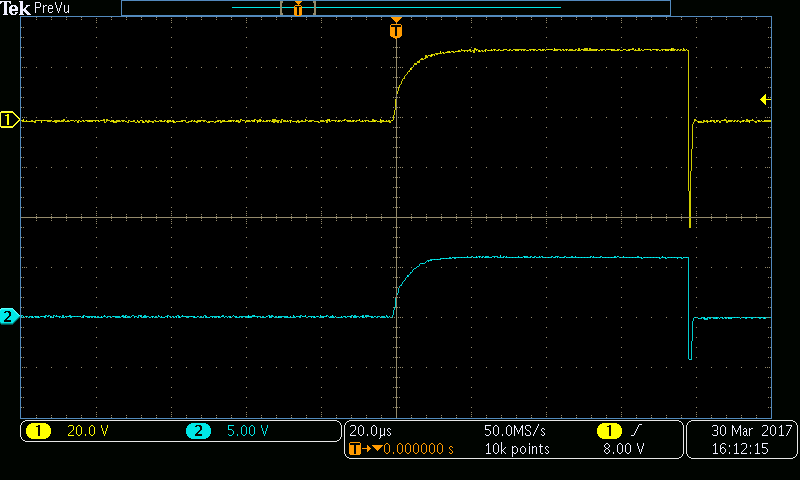 The on resistance is also considerably lower than conventional relays at < 15 thousandths of an Ohm. Critically, unlike electro-mechanical relays, our SSR suffers from NO wear out mechanisms whatsoever even after thousands of switching events at maximum load (60 A for the Model 1721 and 20 A for the model 1701). It is an expensive solution, but it is superior by any measure and that’s why we use it. All Aluminium Construction Importantly, other than the power transformer, Ovation High Fidelity products use all aluminium chassis construction. Most of the fixings are non-ferrous in order to minimize magnetic induction distortion, while air vents on the power amplifier products are stainless steel.